Some relationships are within the family -- such as between parents and children, grandparents and children and between siblings -- while others are between friends. In some cases, these distinctions are blurred (Are short-term partners family members? Are family members seen as such when relations become unfriendly? Does divorce, if amicable, replace a family with a friendship?). 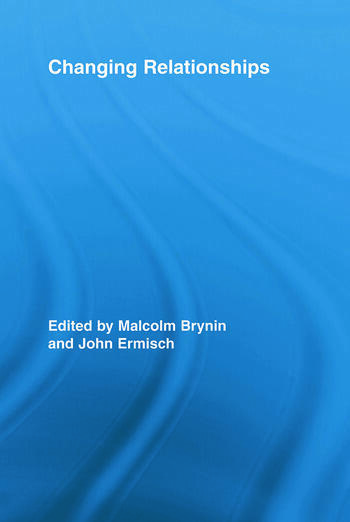 Using quantitative, cutting-edge statistical analysis, in conjunction with a multi-disciplinary approach, the contributors to this volume address the contemporary state of and dynamics in these various types of relationships, linking these to key rites of passage such as leaving home, marriage and childbirth, to see how these stand after a period of rapid social change. The book will be of interest to scholars in a broad range of disciplines, including sociology, social policy and economics. Malcolm Brynin is a researcher at ISER University of Essex. He undertakes research on education, employment, and the family. He has published articles on the returns to education and to skills, and on the gender implications of educational and technological change. John Ermisch is a researcher at ISER University of Essex. His latest book, An Economic Analysis of the Family (2003), and numerous articles in economic and demographic journals demonstrate how the standard analytical methods of microeconomics can help us understand resource allocation and the distribution of welfare within the family.